On January 17, J. Medeiros sent out a MySpace bulletin announcing that the Procussions have broken up. 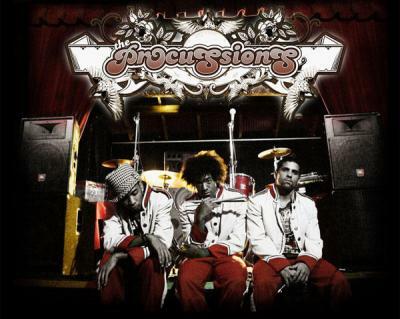 The Procussions — rapper/multi-instrumentalist/producer Stro and rapper/keyboardist/producer J. Medeiros — may be best remembered as one of the groups that anchored Rawkus Records’ comeback in 2006. It blended hot, percussive rhythms with deft MC’ing and a strong moral compass — “American Fado,” a track from their 2006 album 5 Sparrows for 2 Cents featured an appearance from Christian author Renee Altson. However, the Procussions fomented for several years before then. According to a 2004 profile in Westword, the group initially emerged from two B-boy crews, SOL and TSF, in Colorado Springs, Col. in 1998. It began as a quintet, and then eventually whittled down to Stro, J. Medeiros, and rapper/DJ Rez. For their first five years, the group honed its skills while opening for various touring acts like Common and Talib Kweli. (Kweli would lend a guest appearance to 5 Sparrows for 2 Cents). Eventually, they created a label, Basementalism Records with their manager, Mike “Adict” Merriman. In 2001, their first 12-inch single, “All That It Takes,” was distributed by ABB Records and impacted the CMJ charts. Their 2003 debut, …As Iron Sharpens Iron, drew solid reviews in magazines like Elemental and URB. They relocated to Los Angeles; tours as an opening act for Edan, the Roots and, notably, Digable Planets’ 2005 reunion followed. 5 Sparrows for 2 Cents dropped in July 2006 via a licensing deal with Rawkus. That fall, the Procussions went on another package tour with Aceyalone, Ugly Duckling and Mayday. They thrived as a live band, with Stro dipping into a drum solo in the middle of their sets, and Medeiros stalking the stage with a yellow Mohawk. Truly living up to their name as a metaphor for sensory-exploding percussion, the trio made a much deeper impression in person than on their albums, which tended to settle into an interesting blend of positive true-school hip-hop that addressed issues from the rise of celebrity culture (“For the Camera”) to songs affirming their spirituality amidst secular society. Last year, Rez left the group and returned to a graphic design career, while J. Medeiros released his solo debut Of Gods and Girls, with some production help from Stro. When comparing their dynamic stage performances to their two albums (and a 2004 EP, Up All Night), there’s the sense that the Procussions didn’t figure out how to package the crackling energy of their stagecraft into a innovative piece of recorded music. Then again, the same accusation has been leveled at the Roots for years. Who knows what potential the Procussions could have reached if they soldiered on? Regardless, J. Medeiros’ January 17 post revealed some frustrations with the music industry, from the cataclysmic effects of illegal downloading to the group’s inability to build an substantive audience for their quality hip-hop music. He also hinted at a final, unreleased Procussions album called Last Stars. “Stro is working on his solo album! dope! and…. “I got another album that’s DONE! finished! produced by stro! co-produced by myself and Benny Cassette, along with guest vocalist Tara Ellis. “but honest…the label game ain’t going so well right now, trying to get people (labels) to push honest music and creative production is near impossible. specially in the hiphop game. “i dont get it really. its like all the people who dont really even understand, love, or even like ‘song writing’ are making all the decisions around here. “music lovers should run the game and that’s it. “this album im talking about is called ‘Last Stars’ and i honestly think its my and stro’s best work to date…but, eh…lets just hope it can get out there to the public. “the whole game can be really saddening. “ill just use this as fuel for more songs maybe…either way…stay tunesd! “with everything we could say about the industry, the point is, piracy will destroy an independent’s career. “we want to thank everyone who actually invested in this group and helped it too its last breath! we owe you so much! that’s why Stro and I will do our best to carry on our solo careers and work together when possible. “theprocussions have been inevitably shipwrecked, blows taken in the lower deck from the most fierce of all pirates. This entry was posted in Hip-Hop Heaven, News and tagged J. Medeiros, Rez, Stro, The Procussions. Bookmark the permalink.